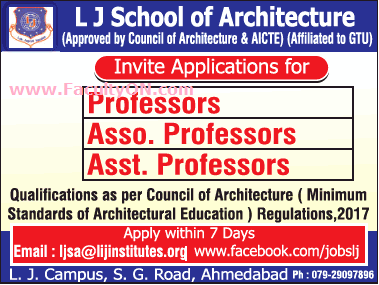 L.J Institute of Architecture, Ahmedabad has advertised in THE TIMES OF INDIA newspaper for the recruitment of Teaching Faculty- Professor / Associate Professor / Assistant Professor jobs vacancies. Interested and eligible job aspirants are requested to apply within 07 days from 18th July 2018. Check out further more details below. About College: L.J. School of Architecture (LJSA) started its academic year in 2013 under the aegis of Lok Jagruti Kendra (LJK) to run full Bachelor degree in Architecture. LJK feels proud to establish the School of Architecture with the aim to develop comprehensive professional Architecture training to bridge the existing gap between formal system and the realistic modern skills requirements of the architecture industry. How to Apply: Interested and eligible candidates are requested to send hand written application along with copies of certificates and 02 recent passport size photo the email address or postal address given below. Reference: Advertisement from L.J Institute of Architecture, Ahmedabad on THE TIMES OF INDIA newspaper dated 18th July 2018 for the recruitment of vacancy position such as Professor / Associate Professor / Assistant Professor faculty jobs. See the copy of advt below.